Hmm. Needs more skill trees. As the resident Action-RPG expert around these parts, I felt it was my duty to cover Path of Exile during Free to Play Week, so here we are. Grinding Gear Games, an independent outfit from New Zealand got tired of the dearth of ARPGs being released at the time (back in 2010) and decided to put together one of their own. Of course, the moment they started development, a thousand new ARPGs started hitting the scene. In any case, they've come up with one of the most player-friendly F2P games out there on top of tossing together a solid game. To be reductive, Path of Exile is basically a more modern take on Diablo 2. So, basically what the majority of early Diablo 3 haters were asking for. From an isometric perspective, you'll click on enemies repeatedly until they die and explode in showers of gibs and loot. Rinse and repeat until your rag-wearing exile turns into a godly warrior slinging white-hot death. Character building is the name of this game. 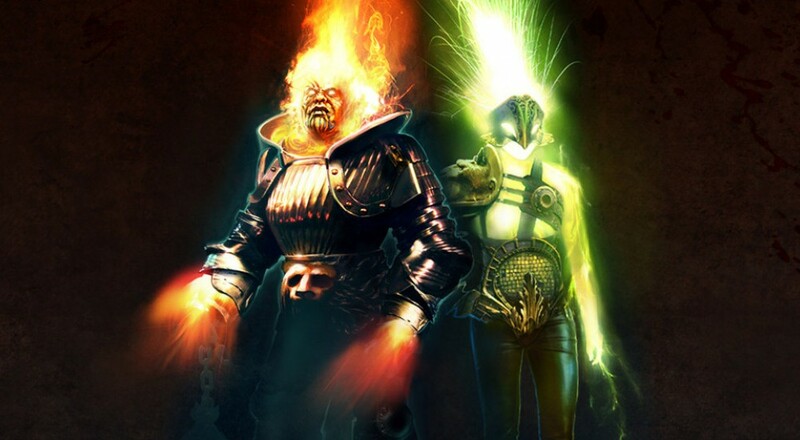 What really sets Path of Exile apart is its character development. The game centers on three core attributes: Strength, Dexterity and Intelligence. The six character classes each represent a dependency on either one of these skills (e.g. Marauder to Strength) or a hybrid of two of them (Templar to Strength/Intelligence), and all have different starting stats. In addition, each character starts in a different spot on the Passive Skill tree (more on this in a bit). The classes are essentially blank slates. Provided you have the stats, all characters can equip whatever items they choose - so while you're probably better served making a Witch that relies on magical skills, it's entirely possible to route her skills to two-handed weapons if you want. Rather than learn them by gaining levels, all action skills in PoE are equippable, color-coded gems. Their color is determined by whatever core attribute they derive power from, and can only be socketed in a gear with sockets of the same color. Socket colors in gear are randomized, but higher weight is given to the colors that match the gear's theme (Plate armor will tend to have more red/strength sockets). Skill gems gain levels independently of your character as long as you have them equipped, and you can resocket them whenever you like. Some sockets are linked to others, which allows the use of a Support gem, which adds special effects to the skill they're linked to. For instance, you could link a Stun gem to your Fireball, which gives that spell a chance to stun whatever it hits. Link a Multishot gem to it, and it'll spew extra projectiles. You get the drill. Creating good support combos with your core abilities is a great way to experiment. 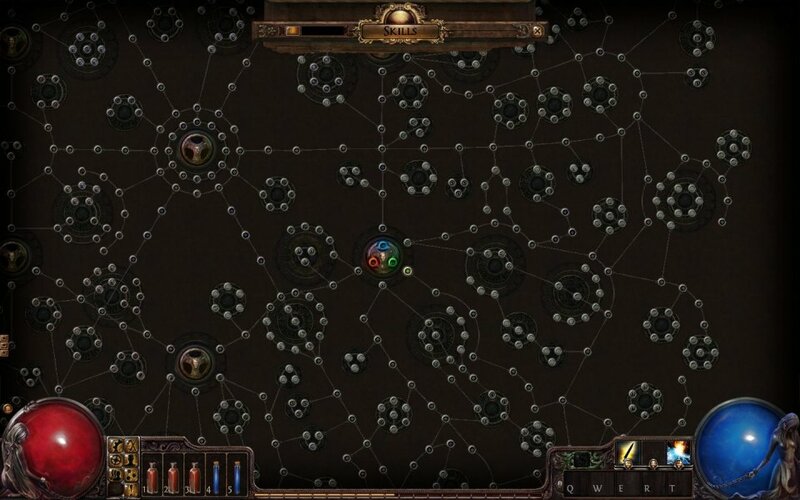 The other way to grow a character is by putting points into the Passive Skill tree, a monstrous labyrinth of 1,350 nodes that closely resembles the Sphere Grid from Final Fantasy X. Gaining levels and completing quests give you points to put into the tree, and each node you activate grants you (you guessed it) a passive bonus to your stats or certain skills. Bonuses range from your standard 20 to Dexterity to Attack Speed modifiers to converting all of your available Dexterity to bonus Armor. It's daunting, but luckily you can "buy back" the last few points if you make a mistake. Combat is standard for an Action RPG, so if the sound of a million mouse clicks is soothing to your soul, you should be happy. However, I've had a little trouble playing melee characters since there's just the vaguest hint of unresponsiveness to physical attacks. Attacks and melee abilities that seem like they should connect sometimes just don't. Oddly, I never really have this issue with the ranged classes so perhaps this one's on me (or perhaps my connection). Still, it's worth noting. This is just the tip of the iceberg - if you ever go down the rabbit hole of researching builds in PoE, expect about ten times the theorycrafting you get out of other games of this type. Whether you like to min/max or come up with ridiculous character builds there's something for you here. Page created in 0.3542 seconds.